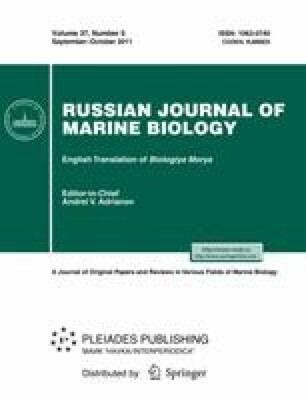 Based on an analysis of the gonads, as well as the size composition and abundance of larvae in plankton, we determined the seasonal and long-term dynamics of the reproduction of the mussel Mytilus coruscus in Amursky Bay (Peter the Great Bay, Sea of Japan). Mussel gonads were in a mature condition in late July-early August; the spawning season continued from mid-August to mid-September. The larvae of this species occurred in plankton from June to September, under surface water temperatures of 14.5–23.5°C. The density of larvae in different years varied from 350 to 4500 ind/m3. Two peaks of larval abundance were observed annually, in June and September. The first peak was apparently provided by allochthonous larvae, the second, by larvae of the local population. The high density of larvae of M. coruscus in the plankton of Peter the Great Bay enabled us to consider this species as a potential object for mariculture. Original Russian Text © V.A. Kulikova, S.A. Lyashenko, N.K. Kolotukhina, 2011, published in Biologiya Morya.